I have no idea why I am starting a blog. I have no theme for my blog (i.e. cooking, baking, teaching, music, etc. ), but I love to write and share. After viewing many lovely blogs about teaching and cooking/baking (two things that I deeply enjoy), I caved. These two things are things that I love (especially teaching), but they are not things I would say I am perfect at (although perfect is so boring) and am not sure if I could devote an entire blog to those things. So, my blog's theme is just about life- learning to love the life I have been given. And, thankfully I do. I feel as though my first post should be about the number one thing on my mind and that would be my car. Sounds silly. My car is my baby. Her name is Ravy. She is a 2011 Rav-4 and I bought her in January. She is my first brand new, never been used car and I love her. However, a horrendous hail storm ran (although, it lasted 30 minutes so perhaps I should say "jogged" extremely slowly) through Platte City on Sunday morning at 1:00. The storm woke me up, making me think that someone was violently banging on my door and windows. I sat straight up, grabbed my mace, and prepared myself mentally for my attacker. Jasper, my precious pup, barked violently at my window. Creeping cautiously into my living room, I realized that my entire apartment was shaking and that the scary noise was actually baseball-sized hail. Once it was over, I threw on my glasses and a jacket and went outside with the rest of my neighbors to inspect the damage. Every car in the apartment complex had horrible dents and broken windows. I drove my car over to my parents' house to keep inside their barn so that the rain did not get inside through the back window which hail broke completely. 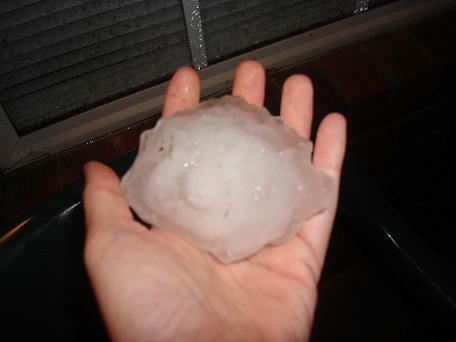 This is how big the hail was. Literally, the size of my palm! 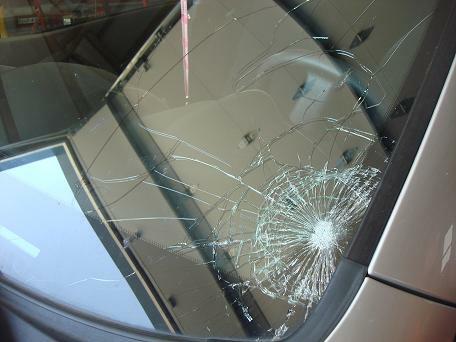 Here's my front windshield which made my car not safe for the road. I guess it could break while I'm driving! Who knew? 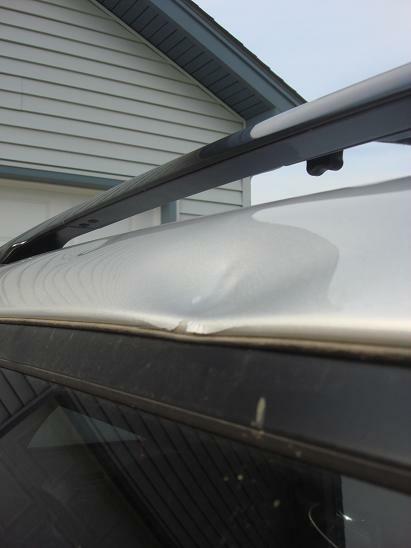 Here is one of the larger dents. There were a couple larger, but the photos did not turn out well. Silver cars take crummy pictures. Fortunately enough, my car is already in the body shop and it's a body shop full of people I barely know, but trust to take care of my baby. She's been in there once already this year (due to my own careless driving) and they took wonderful care of her. I just have to keep reminding myself that God has a plan for me. I'm so excited that you started a blog, Lish. No theme necessary- your stories are significant without it! 'Still so sorry about your poor auto-baby. Things will look up soon- just like you said, God has a plan! Thanks for following my blog! I'm a second year teacher too :) Well, I guess I'm going to be a third year teacher soon! So crazy--where did the time go? That hail is INSANE!!!!!! Yikes! That is a great tip! Writing your first post can be challenging, because you have to post something that will spark your interest, and inspire you to write more. But if you write something that you love, you will surely be motivated to write more. And for you, that motivation is your car. It just too bad that your car got damaged during the hailstorm. Fortunately, there is a body shop nearby that was able to repair all the damage soon after.